Total shareholder return measures the combination of share-price gains and dividend yield for a company’s stock over a given period of time. It is the most comprehensive metric for measuring a company’s shareholder-value-creation performance. TSR is the product of multiple factors. 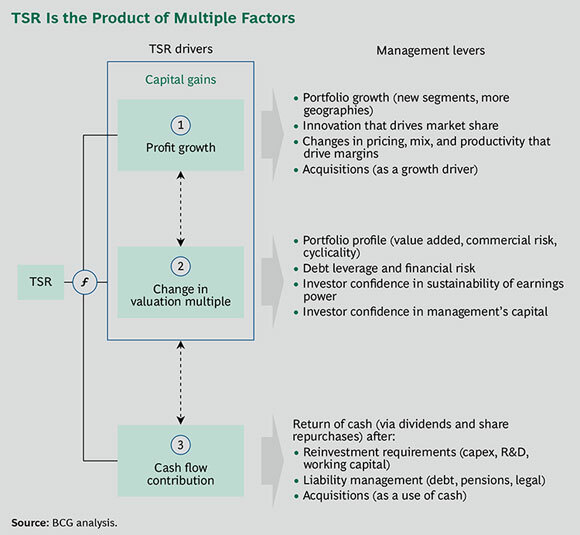 Regular readers of the Value Creators report should be familiar with BCG’s model for quantifying the relative contribution of TSR’s various sources. (See the exhibit below.) The model uses the combination of revenue (sales) growth and change in margins as an indicator of a company’s improvement in fundamental value. It then uses the change in the company’s valuation multiple to determine the impact of investor expectations on TSR. Together, these two factors determine the change in a company’s market capitalization and the capital gain or loss to investors. Finally, the model tracks the distribution of free cash flow to investors and debt holders in the form of dividends, share repurchases, and repayments of debt to determine the contribution of free-cash-flow payouts to a company’s TSR. The important thing to remember is that all these factors interact with one another—sometimes in unexpected ways. A company may grow its revenue through an EPS-accretive acquisition and yet not create any TSR, because the new acquisition has the effect of eroding gross margins. And some forms of cash contribution (for example, dividends) have a more positive impact on a company’s valuation multiple than others (for example, share buybacks). Because of these interactions, we recommend that companies take a holistic approach to value creation strategy. Without taking anything away from the achievement of the companies listed in Exhibit 1, it is only fair to point out that structural factors can play a large part in determining which companies make our top-ten lists. One of those factors, of course, is survivor bias. For every company that hits the jackpot in drug discovery, for instance, there are countless others that do not. A second factor is company size. BCG research shows that, over time, sales growth is the most important driver of shareholder value for top-quartile value creators. Little surprise, then, that whereas the median average annual sales growth for this year’s Value Creators sample was 8.4 percent, the median for companies that made our top-ten rankings was substantially higher—13.7 percent. All things being equal, it is easier for a company to create value through sales growth when it is starting from a relatively small base than from a large one. That may explain why, although 49 percent of the companies in our database have a market capitalization of less than $10 billion, 57 percent of the companies in our top-ten global and industry rankings do, and a full 7 out of 10 of the companies in our global top ten do. The strong impact of company size is part of the reason we also publish, in addition to our global top-ten list, a global ranking of the top large-cap value creators, drawn from the 177 companies in our database with a market capitalization of more than $50 billion. (See the right-hand list in Exhibit 1.) But even in this subset of the largest companies, size can play a major factor in determining the companies that make the top ten. For example, this is the first time in the past nine years that Apple has not appeared in our large-cap top ten (although it does come in at number eight in our rankings for the technology sector). And yet Apple, with a market capitalization of roughly $647 billion at the end of 2014, is by far the largest company in our sample. The fact that the company was able to deliver an average annual TSR of 31.1 percent is as—or even more—impressive than the TSR performance of the companies included in the large-cap rankings with market caps between roughly one-tenth and one-fifth that of Apple. A third structural factor affecting our annual rankings has to do with the particular industry a company happens to be in. At any given moment, some industries will be performing substantially better than others. This, too, has an impact on which companies end up among the very top value creators. For example, consider the biopharma sector, which, with a median average annual TSR of 24 percent, was one of the best-performing industries (second only to fashion and luxury) in the 2010–2014 period. Similarly, biopharma companies are well represented among the world’s best performers. They take four of the top ten spots in our overall global ranking. In addition to Pharmacyclics at number one, the list includes Ireland’s Jazz Pharmaceuticals at number five, Regeneron Pharmaceuticals at number seven, and Israel’s Taro Pharmaceutical Industries at number eight. Biopharma’s dominance of the large-cap top ten is even more pronounced, with companies from the sector capturing five of the top ten spots: U.S. companies Actavis1, Biogen, Gilead Sciences, and Celgene at numbers one, two, six, and ten, respectively; and Denmark’s Novo Nordisk at number seven. Actavis changed its name to Allergan in June 2015. We’re sympathetic to that reaction. Partly, it’s a matter of outlook. A substantial part of the TSR that companies have generated in recent years has been achieved via multiple expansion. But if the expectations of the respondents to BCG’s annual investor survey are any indication, valuation multiples may be declining rather than rising in the near future. (See “Investors Anticipate a Soft Landing,” BCG article, May 2015.) And many investors believe that a number of specific sectors will underperform the market in the years ahead. (See Exhibit 2.) So, it’s likely that many companies will fall into the catgory of “the rest of us” in years to come. But we are also sympathetic out of conviction. The fact is that, no matter how large a company happens to be or how many challenges its industry may be facing, some companies nevertheless substantially outperform the average. The graph on the left in Exhibit 3 shows the median average annual TSR for the 27 industries that we tracked this year. The medians ranged from a low of –8 percent (in mining) to a high of 25 percent (in fashion and luxury). The top value creators in each industry, however, substantially outpaced their industry medians by anywhere from 8 percentage points (in insurance) to 28 percentage points (in both chemicals and construction). And as the graph on the right in Exhibit 3 illustrates, in every sector except mining, the median average annual TSR of the top ten beat the median average annual TSR of 14.6 percent for the entire Value Creators database. In the end, what really matters is not a company’s absolute TSR performance but, instead, its performance relative to its peers. Put another way, what counts is not the cards a company is dealt but rather how it plays those cards to optimize its value-creation potential. That’s why this year’s Value Creators report highlights the experiences of two companies, each facing a serious crisis, that used a focus on value creation to jump-start a far-reaching organizational and business transformation.2 The management teams at Danish container-shipping giant Maersk Group and U.S. home builder PulteGroup confronted an extremely tough economic environment that challenged long-held beliefs about how they created value. Both used the crisis as an opportunity to step back, rethink their approaches, change their value-creation strategies, and fundamentally transform how they they ran their businesses. As a result, they were each able to chart a new course and deliver superior shareholder value relative to their industry peers. How they did so contains lessons for every company. Maersk and PulteGroup may not be top value creators on a global basis, but they are classic examples of value creation for the rest of us. For more on the theme of transformation, see Transformation: The Imperative to Change, BCG report, November 2014, and The New CEO’s Guide to Transformation: Turning Ambition into Sustainable Results, BCG Focus, May 2015.